Czeck Edge tools are currently only available to UK woodworkers direct from the workshop they're made in Marietta, Georgia, USA. I get a real kick out of using tools produced by artisan makers. Provenance pays a big part in the allure of such items and nothing beats buying direct from the shop where they were made. It was a happy accident that we were in touch with Bob Zajicek, owner of Czeck Edge Hand Tools, when he was just days away from launching a new version of his widely acclaimed Kerf Kadet marking knife. We were hoping to get our hands on their Series II dovetail chisels, but a change in the production methods of these meant that stock was not available. Timing, as they say, is everything, so we were delighted to accept Bobâ€™s suggestion for an alternative. The Kerf Kadet has been around for a few years now and one wonders about the need to change the design of something that already works extremely well. The Kerf Kadet II still features an exotic hardwood handle and bronze ferrule, but has a couple of modifications that give the user extra options for achieving a more comfortable and controlled grip. 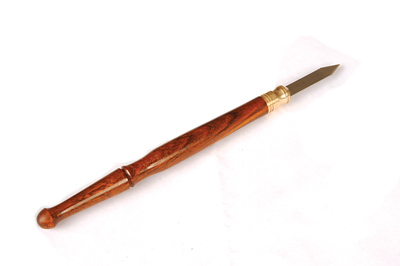 Thin enough to be held pencil-fashion, the ferrule on the Kerf Kadet features three grooves to prevent it from slipping through your fingers. Version II has a longer ferrule that now includes a slight hollow to register with the side of the middle finger when gripped this way. A more subtle change is the lack of taper in the handle directly behind the ferrule that encourages the fingers to search instinctively for a more comfortable position closer to the blade. Now I'm not so sure I always use tools exactly the way they were intended and the Kadet II seems to have taken this into consideration as the design now lends itself to alternative grips further down the shaft. The O1 steel blade is only 0.7mm thick and 8mm wide with two 40° bevels ground on one face to a 40° spear point, with the other face left flat to aid registration against a straight edge or appropriate component. Not all tools have the ability to inspire confidence, but where better to introduce it than at the marking-out stage of a process? 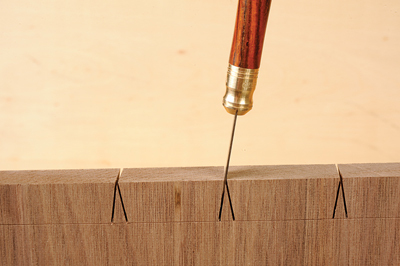 The Kadet II requires the operator to adopt a light touch, encouraging greater accuracy and is the smallest of their range of knives; so-called because it is fine enough to mark out dovetails of a single kerf thickness. I call them London pattern dovetails, but I stand to be corrected on that if you know different. One thing I'm certain on which we will all agree though is that the Kerf Kadet II is an absolute joy to use.